Canon has finally announced it, and although it doesn't seem all that compelling of an upgrade I am compelled by it and the reasons might not be what you think. For the past year I've been running two full frame cameras, the Canon 5DmkIII and the Sony A7. Both are similar in specs to each other, and despite much of rhetoric out there, they are also equal in image quality. As the internet explodes with trolls and Canon haters over this newly announced camera, I add my opinions and thoughts on this latest offering that seems to be incremental in features, and why someone like me who has made some moves to get away from the dSLR format to much more compact mirrorless cameras. I'll also point out that Nikon also made their new announcement of the D750 which has it's pluses and minuses. Neither which should be of concern to Canon or Sony as it is targeted to a different segment. My cameras are tools, and as such, each camera has it's specific pluses and minuses. In terms of what I'm running right now is a bit redundant in the image quality area. Having two full frames is a bit odd but why I have both comes down to functionality and ergonomics. As much as I love the Sony A7, it just doesn't suit my professional needs in terms of speed, accuracy, long term use, durability, longevity and user experience. These are all things that my 5DmkIII provides and something that makes kind of sense for me to ditch the 5DmkIII for the 7DmkII. Before you all say I should take my crazy pills in the morning before writing, I'll focus on the reasons why my 5DmkIII suits my professional needs over any mirrorless cameras (including Olympus, Panasonic and Fuji ones). The latest feature of the new Canon 7D is 10 fps, 65 AF all cross points and iFCL metering assist are basically what puts all other speed systems to shame. Despite all the claims that are out there on the mirrorless side of things, even with the Fuji X-T1, there is no doubt in my mind that this combination will trump any speed requirements for a shooter. This includes wildlife, sports, action and event photographers. Although the -3 ev centre point does not sound all that impressive, the important thing will ultimately be tracking among the 65 AF points and the iFCL linked metering assist (a feature found only in the flagship 1Dx). iFCL tracking is very similar to a feature that is found on pretty much all Nikon cameras called 3D tracking. It's an important feature that uses colour metering information to link to the auto focus points. Despite all the claims of fastest AF on mirrorless cameras, it still lags behind. My experience with all the various options have been pleasant but ultimately still has issues with accuracy. The 10 fps is also impressive, but there are mirrorless cameras out there that provide faster. Yes they do provide faster fps, but they generally don't include AF accuracy to go along with that. Press the shutter, and the frames do not track the AF of a subject. Shooting subjects approaching you will not track the AF on those systems, while the new 7DmkII will certainly do that with no issues. Mirrorless cameras these days claim speed and accuracy with their new AF systems. Canon certainly will say that their new offering is far superior to those claims. Bottom line ultimately will be when it has been field tested, but drawing from experience of using most of the systems out there, I'm pretty certain from the new specifications that the 7DmkII will trump them all. But regardless of that, what is accuracy to a shooter? Ultimately having things drop out of frame and easily return into frame is common with event shooters. I've seen enough online review examples of videos where people that tout the strength of one system's tracking by keeping everything in frame. Reality or at least from experience, people drop out of frame all the time and you need to get them back in the same frame and in focus. This is not a strength of even on sensor phase detect focus. Impressive as some systems like the Sony a6000 is (a camera I'd love to own), it will still hunt when things drop out of frame. Trying tracking an object on a neutral background and once something drops out of frame, the camera will lock or seek on the background. An example of one of my associates who shoots an X-T1. He loves to shoot rodeos with it, however in the 600 shots that he might take on average with it, he'll get maybe about 25% of them that are in focus and accurate. He's not afraid to admit that this camera is not well suited for that kind of work and so he often will fall back onto his Nikon D7100 for that kind of shooting where he gets about 80% of the images in focus. Accuracy also comes down to metering. Canon is playing a little catch up here by also including AF linked spot metering in the 7DmkII (a first in models not the top of the line flagship cameras). Ah hah, you'll say, Nikon and mirrorless cameras have been doing this for some time now. Yes, and no. AF linked spot metering is varied in sizes on the Nikon, however it is there and it works accurately enough. Good work on Nikon, but they really need to make sure it doesn't vary in sizes across the various models. On mirrorless, the metering is a liveview, histogram based interpretation. Both Nikon and Canon have intelligent/smart metering processors that compares databases to the images you're trying to capture. It makes decisions that ensure perfect metering. Currently at least, none of the mirrorless models out there have intelligent metering. Most of them base their metering on histogram information alone, which tends to have consequences when you go to AF linked spot metering on those cameras. Even in AF Linked Spot metering, there is a 'weighting' that is considered, and with the new RGB iFCL sensor in the 7DmkII, the meter, the database, and the AF linked Spot metering, should provide the best balance of that feature without having issues with bad exposures. Simply put, dSLR's ergonomics reign supreme here. Hand sizes vary and so should cameras, but reduce that camera too far down, you compromise the ergonomics which means shooters that might shoot 6-8 hours with a camera will really feel it. Shooting running events, I know that a camera needs to be comfortable enough that I don't start to cramp up. Small cameras are appealing for weight, but try holding that up for an hour and it won't matter how light the camera is when your fingers start to cramp up. Even if you shoot on a tripod or monopod all day, the small compact mirrorless cameras will show its limitations in short order. The other part of longevity is battery use. It's easy to just say, stick on a battery grip and be done with it. That adds bulk and weight, but does provide function for portrait orientation shooters. However I can easily shoot 6-8 hours on two batteries in a grip (usually end up using only half my batteries for around 6000 images), the same cannot be said with a mirrorless equivalent. Batteries are small because the cameras are small, and their capacity is pretty limited still. The 7DmkII has a new battery that ups the capacity of the already impressive LP-E6 battery. Although I can't imagine doing an 8 hour shoot without a battery grip, I can be certain that I'll likely never need more than two batteries in the field with a higher capacity 7DmkII battery. Some of this is subjective. User experience comes down to interface design both inside and outside the camera. The dSLR format is an old and tested format that works. Take for example attempts like Sigma's DP Quattro on their attempts to breaking that form factor. Like I mentioned before in long term use, the ergonomic design is so very important in the successful function of the camera. Mirrorless cameras are small, miniaturized and simplified. They are great when you're out hiking and not hauling 20lbs of camera gear, but reaching for tiny buttons and looking for shutter buttons that require a Captain Hook finger to press the shutter are not my ideas of perfect ergonomics. I love the Fuji cameras for their physical ergonomics, but their software interface is kludgy and unless you're a waiter/waitress who's used to everything on one screen POS interface, it isn't all that pleasant for the generic user. Olympus has made wonderful miniaturized versions of dSLRs but everything is way too small and access with larger hands. As a UX designer myself, I'm always watching and observing how people interact with devices. Watching large people use mirrorless compacts is painful from a design point of view, and yet those that still use them, swear by them. I know for a fact that after several hours of use, that it would get weary for me, but then again, I also know that user experiences do vary and are very subjective (and are also subject to how they plan to use the camera). For example, I never thought oversized smart phones or phablets would be so popular, but they are. Durability is another issue to be concerned about. The new 7DmkII claims to have 4 times better environmental sealing and of course is made on a strong and trusted magnesium chassis. For professionals or event shooters, this is something they can trust will hold up to their demanding requirements. Many of the compact mirrorless cameras claim some level of environmental durability, but in reality they are still delicate electronics that I wouldn't dare bump or drop. My mirrorless cameras have always been babied around my neck and close to me, while my dSLR comfortably dangle from my hip without too much worry. I don't know if I will be adding the 7DmkII to my collection or not, but I wanted to share my thoughts on the whole point of dSLR relevancy. With the growing popularity of mirrorless (CSC) cameras despite reports that it has flat lined in popularity, the question will come down for many users why they would still consider the dSLR. 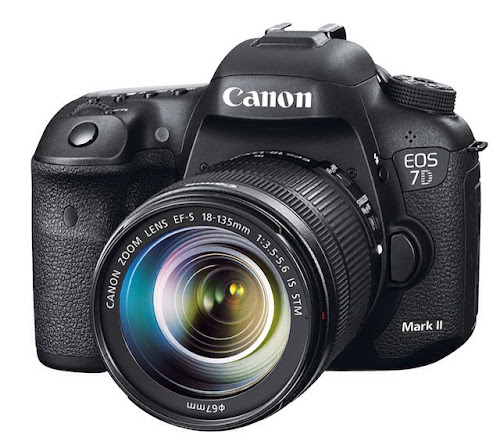 The 7DmkII is not something that is marketed to keep people from going to the mirrorless system. It's targeted specifically for one segment and one segment alone: Professional and semi-professional action shooters that need comfort, durability and accuracy. The closest mirrorless system to that is probably the X-T1. The APS-C sized sensor can live on in the dSLR format and not be exclusively on the mirrorless format. Zach Arias posted an interesting video a little while back about why you don't need full frame, and I mostly agree with his points. But I also believe that dSLR still has it's important position in the market, and will continue to do so until still photography is either completely displaced by video, or mirrorless finds some magic way to address my specific concerns. Until then, I believe the 7DmkII is going to continue to challenge supremacy in it's specific segment regardless of all the haters and trolls that feel that this camera did not meet their expectations. To me, at least on paper, it sounds like a fabulous upgrade, and for all the right reasons for the market it is targeted for. Interesting perspective, and I have to agree with you. I don't get the whole mirrorless craze, but your points make sense. Well mirrorless does have it's place and for most enthusiasts I think will suit most of their needs. Even professionals, like wedding photographers and studio photographers will be fine with Fuji or Sony, but ultimately the sports/action shooter will be the toughest one to satisfy. Thanks Terrance! Appreciate the read. Interesting points as usual. Great read, and nice to see a new post! Hope you put up more.